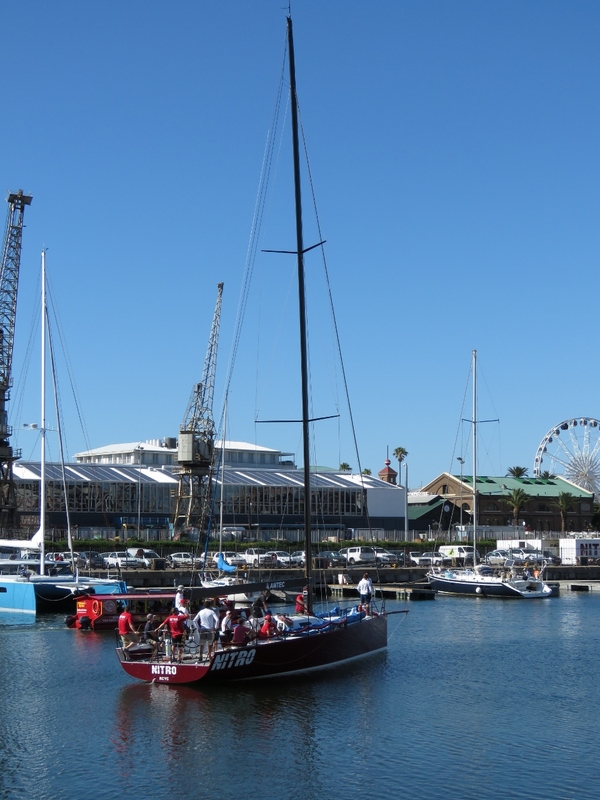 We’ve been in Cape Town for a month now and have really enjoyed the city and our berth at the V&A Waterfront. In between seeing the sights, we’ve also been completing some boat projects and getting ready for the next big run across the Atlantic Ocean. And James has spent a fair bit of time at the Amazon Cape Town office. The boot drive in Jennifer’s laptop (top left) died in East London, so she’s been running off our boat laptop (right) with the data drive from her laptop plugged in externally (bottom right). We just got a new drive here in Cape Town and are starting the somewhat slow and painful process of reloading all the software. 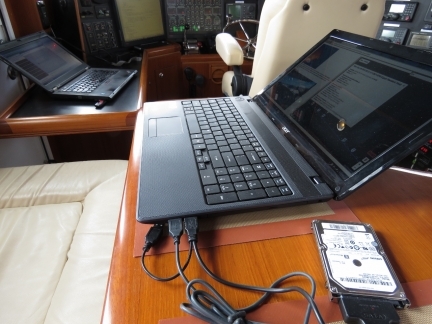 The boat laptop is purely a spare that we normally kept in the safe with any other sensitive electronic spares, such as our spare engine ECU. If a lightning strike should wipe out our electronics, hopefully the safe will act as a Farraday Cage and we can continue to function on the spares. 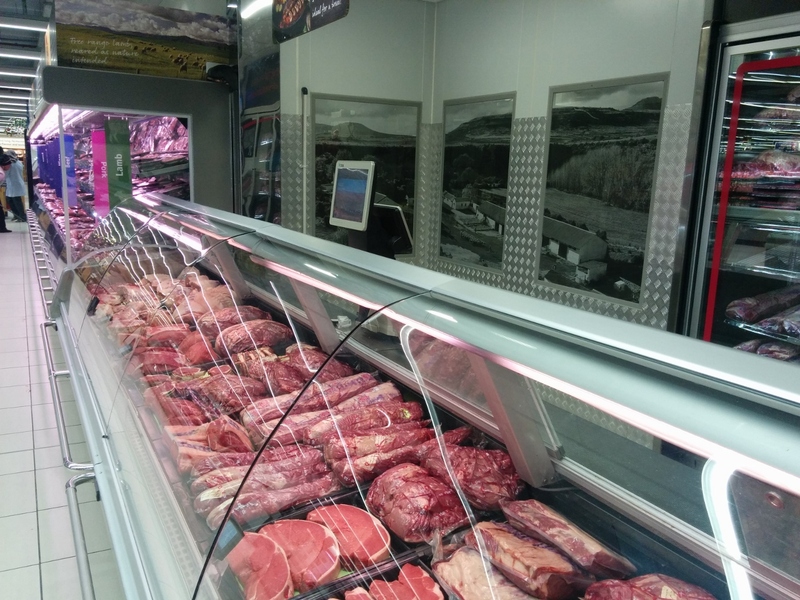 Both Richards Bay and Cape Town have small, but incredibly well-stocked Woolworth’s grocery stores with excellent quality food. 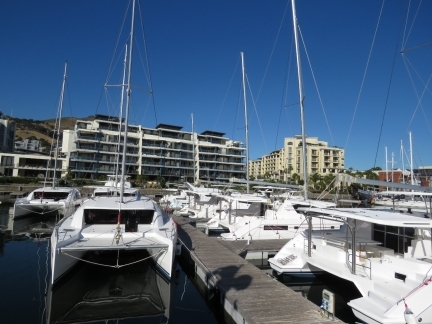 Close to twenty brand new Moorings, Leapord and Sunsail catamarans now fill every available space on the pier we’re on. 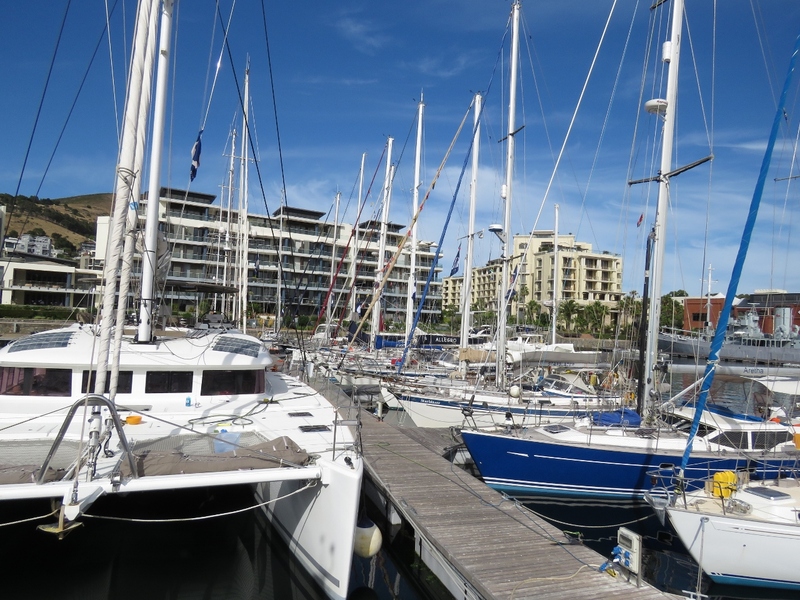 Today they’ll all be loaded onto a ship and the marina will be almost empty for a few days until the World ARC fleet arrives. 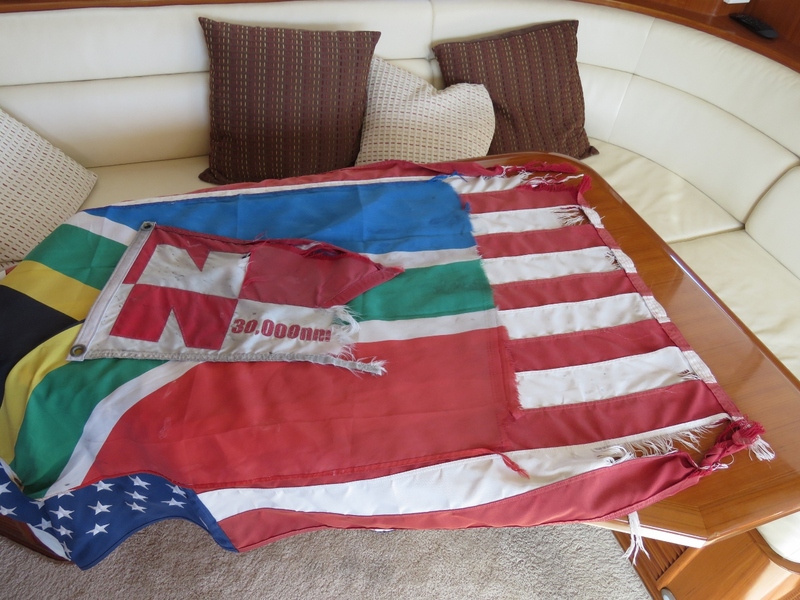 Our US ensign, South African courtesy flag and Nordhavn pennant are all looking pretty beat so we replaced them all today. We’d been holding off until we got to Cape Town and through the worst of the flag-shredding winds along the coast. We put up a 35,000nm Nordhavn pennant and we’ve got 40,000 and 45,000nm pennants waiting in our mailbox in Seattle. 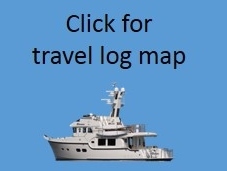 By the time we reach Barbados, we’ll have logged over 50,000nm. 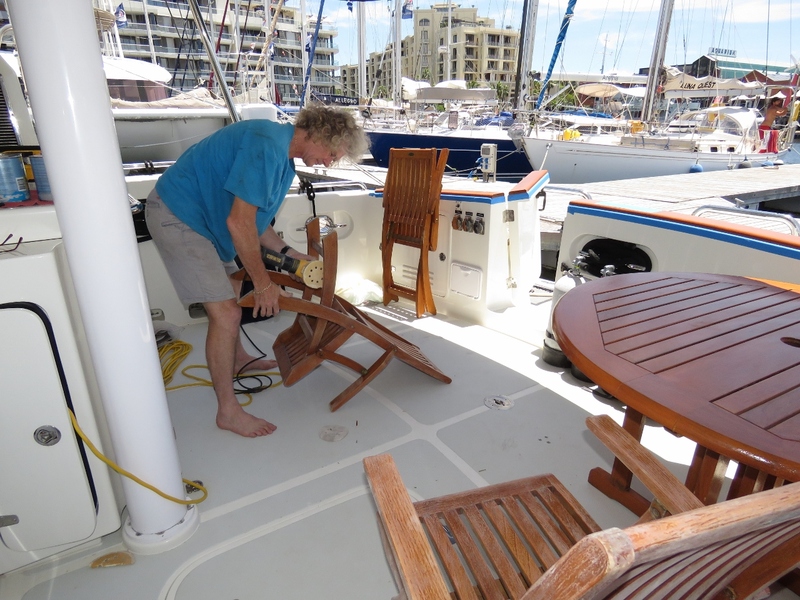 We tried to straighten the barrel bolt that bent in the big wave near East London, but it broke before straighening so we replaced it. 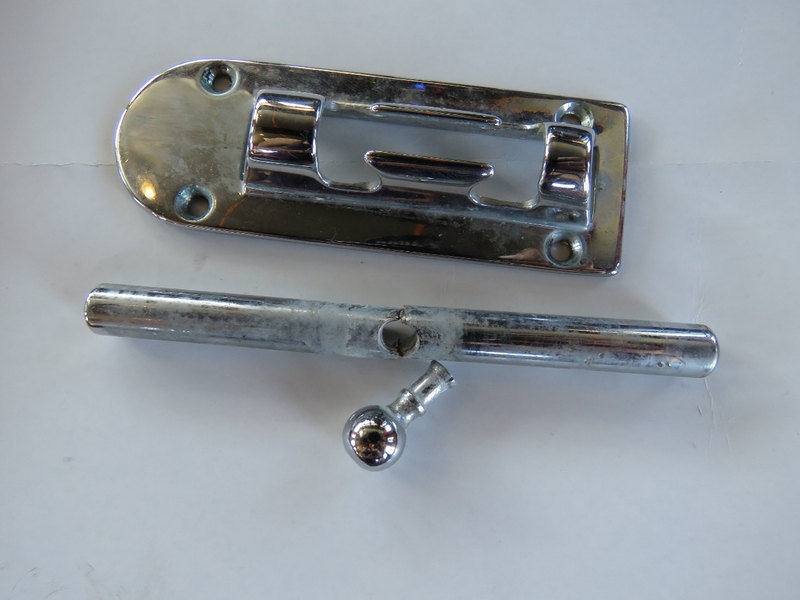 We now carry spares after damaging one during the 69.1-degree roll at Wide Bay Bar. 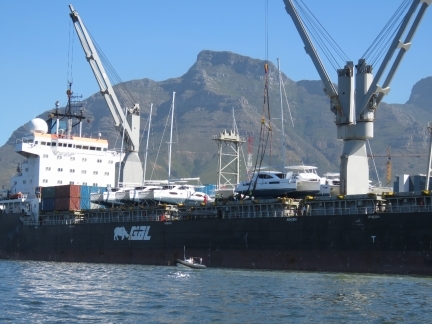 The bulker Yellowstone will carry the new catamarans to Tortola in the British Virgin Islands. 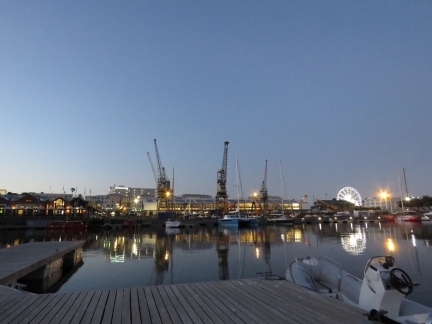 The view towards Victoria Basin over dinner at the Quay Four Tavern. 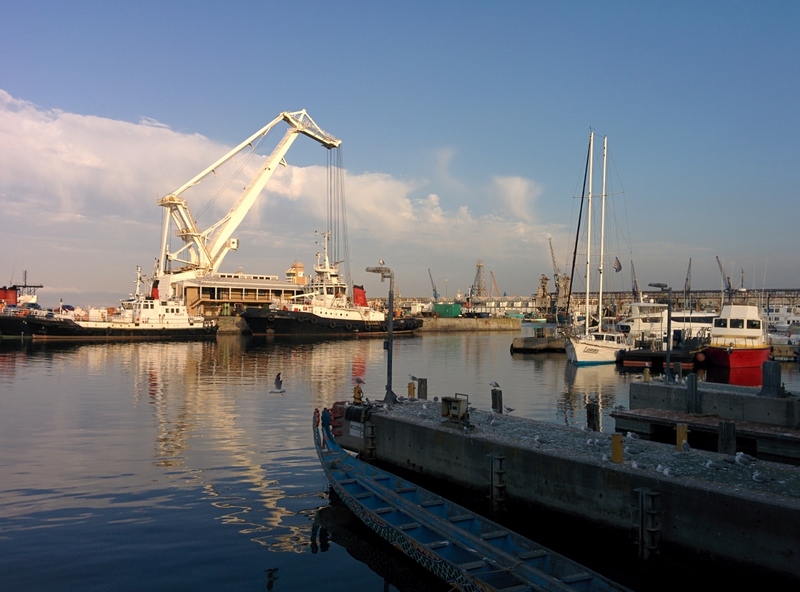 The pilot boat Petrel and the tug Merlot are moored on the wall at the left of the photo. 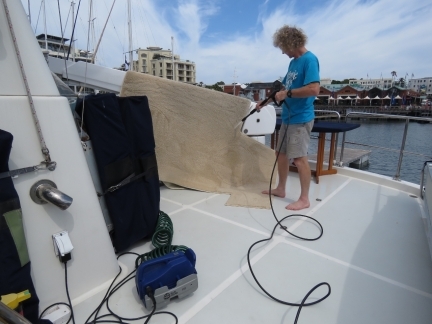 We had the carpets professionally cleaned a couple of times while in Australia, but they didn’t come as clean as we’d hoped. They’re quite dirty now, particularly after all the dust in Richards Bay so we experimented with cleaning them using the pressure washer and scrubbing the dirtiest areas with soap and water. This washed out rivers of dirt. 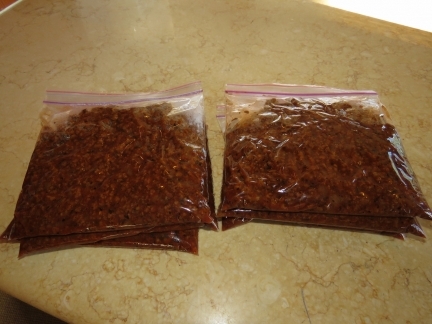 We then left them out to dry for a day in the hot African sun, turning them over occasionally. The time and effort was worth it. The carpets now look and feel quite clean, much more so than after professional cleaning. We’d order three 20L pails of Castrol Vecton 15W40 from All Shipping at Bunker Point. This also is where we will take on fuel before departing Cape Town on our run across the Atlantic. The oil arrived today, so we took the dinghy over to pick it up. All Shipping transported the oil down to the dock for us while we climbed the ladder up to their office to pay. The view to the V&A Waterfront over dinner on our back deck. We sure have a great spot here. 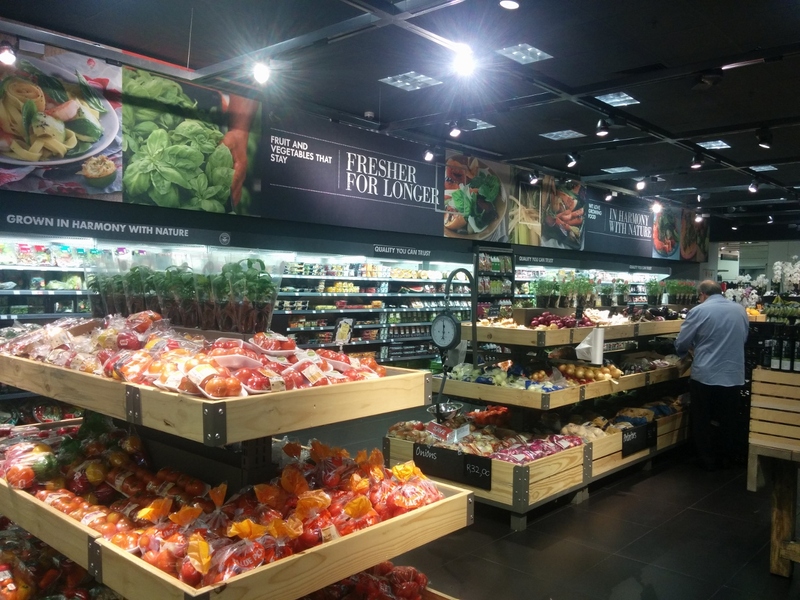 We often find ourselves in a new city and finding a high quality grocery store is always high on the agenda. Besides an excellent Woolworths food store, the V&A Waterfront mall also has a large and well-stocked Pick N Pay grocery store with a high-quality and exctensive meat selection. All but one of the fourteen-strong World ARC fleet have now arrived. We’re in the only non-ARC berth on the entire pontoon. That boat on the left of the photo is Makena, a massive 62′ Lagoon catamaran with a 45′ beam. It’s been two years since we last repainted our teak in New Zealand. The caprail and cockpit table surface still looks good, but the chairs had worn down to the wood in a few places. Here James is giving the furniture a light sand before we paint. We’re only doing the cockpit furniture and caprail this time. 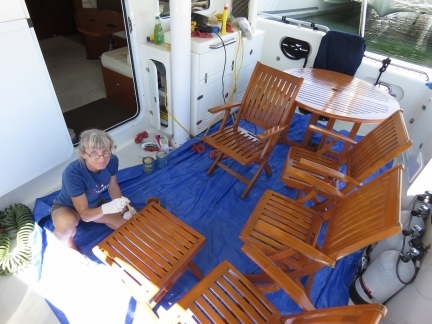 We’ll do the boat deck furniture separately to keep the job size more manageable. 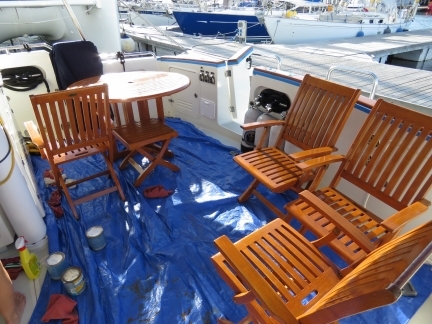 Done for the day with a full coat of Cetol Marine Light on all the lower deck furniture. It already looks much better. Applying a second coat of Cetol Marine Light. 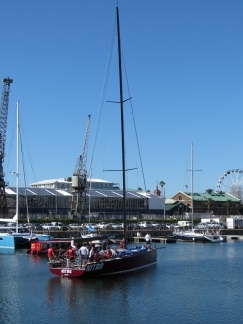 The V&A Waterfront is understandably a popular photo-shoot locale. We’ve seen several since we’ve arrived. 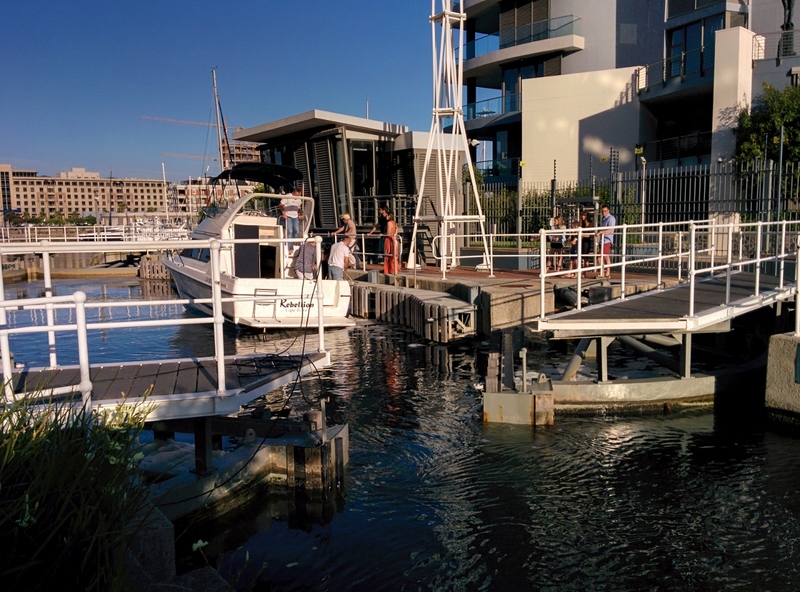 After passing by countless times, we finally saw an opening of the small lock off the marina. Note the power cord hanging from the gate on the left (click image for a larger view). 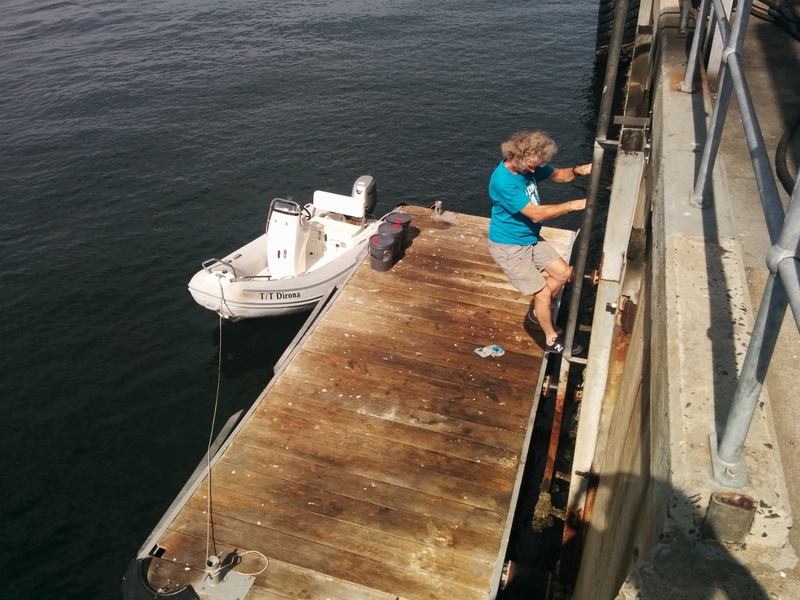 Someone had run an extension cord across the lock door/walkway to power a boat on the other side. When the lock opened, the cable was torn out and one end fell in the water, fortunately it was the non-powered end. Power and communications cable theft for raw materials resale is a big problem here. 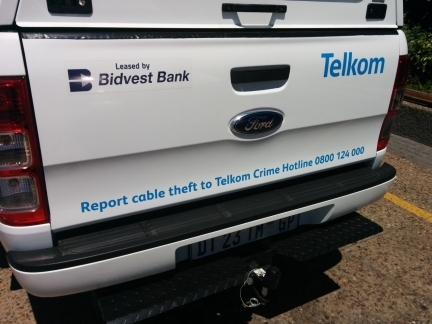 We’re surprised even live power cables can get taken. 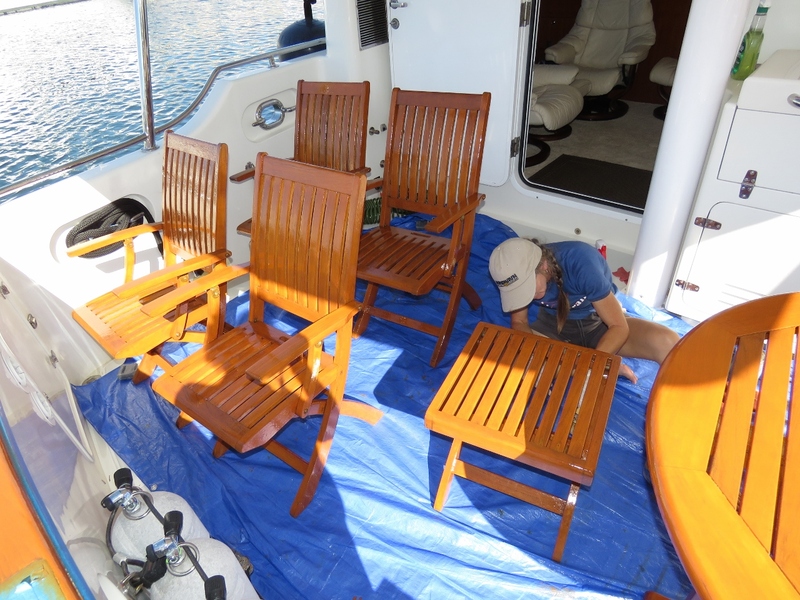 Applying the final coat of paint–the teak is looking wonderful. We’ve been putting on two coats a day, one in the morning and one in the late afternoon, for 2-3 coats each of Cetol Light followed by Cetol Gloss. The paint takes longer to dry this way, but we get the job done and the cockpit back in order sooner. 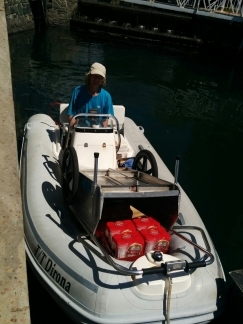 Jennifer made a beer run with our folding cart to Pick n Pay in the V&A Waterfront mall. 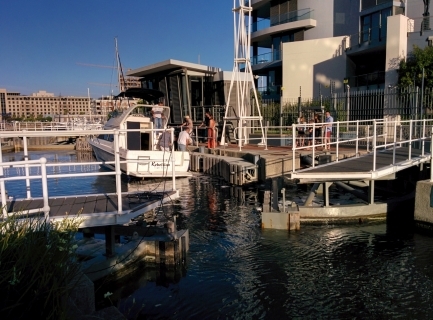 With several sets of steps to negotiate in order to reach the pontoon, it was a easier for James to pick her up by dinghy near the marina office. We sure love that folding cart–it gets a ton of use. Every Wednesday evening, a small group of race boats heads out to sea. We’ve never actually seen the racing, but everyone always seems to return happy, beer in hand. 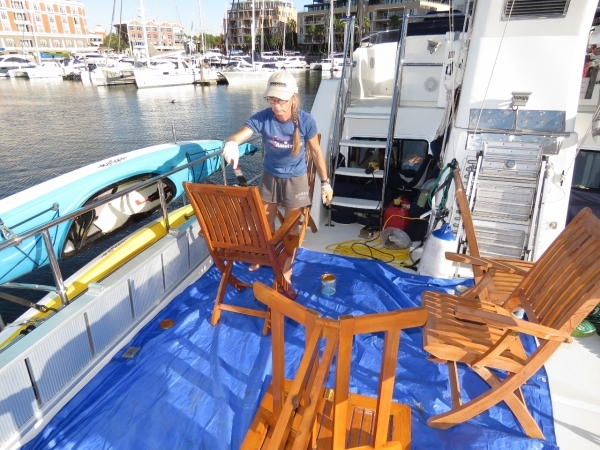 We started in on repainting the upper deck furniture today. It’s a big job and nice to get started. We’ll be even happier to finish. Someone from one of the apartments around the marina was flying a drone around the area. It hovered over Dirona for quite some time. 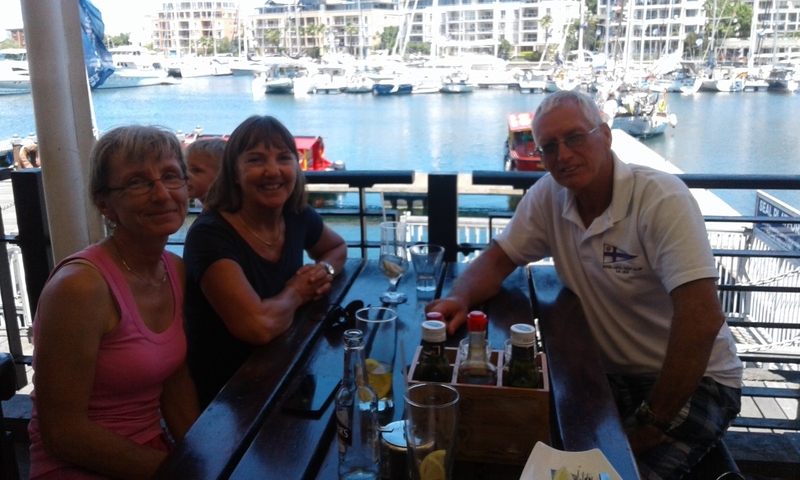 Jean and Matt Findlay of Superted V stopped by for lunch. 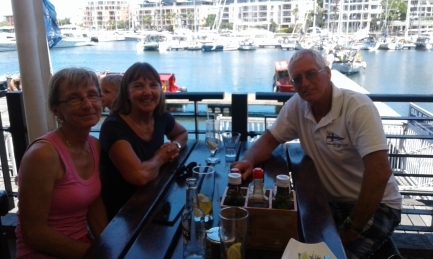 They’re staying in Simon’s Town over Christmas and were in Cape Town to pick up a rental car. We’ve not seen them since Reunion and had a great time catching up. 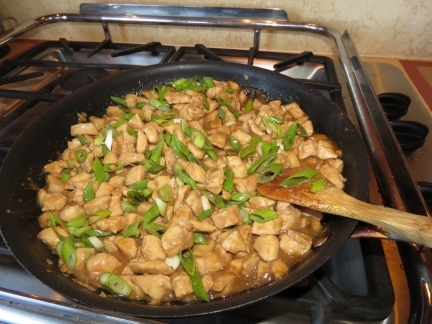 Making a batch of stir-fried chicken with dried red peppers to have on hand for the Atlantic Ocean crossing. We generally cook regular meals while at sea, but when conditions are rough or we’ve gotten busy with something, it’s nice to have a quick and hearty meal available. 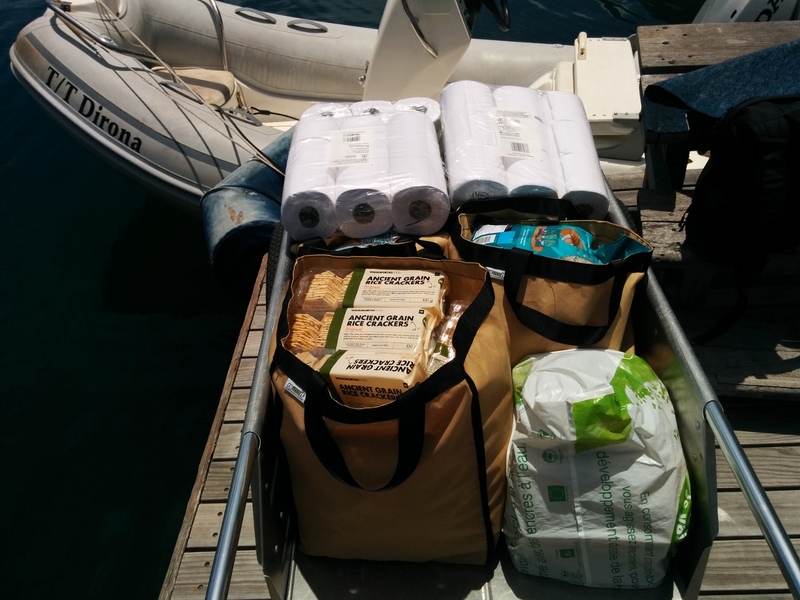 Bringing back a load of groceries from Pick n Pay and Woolworths by cart and dinghy. This is our third trip and we have one or two more to do before we are all stocked up for the Atlantic crossing. 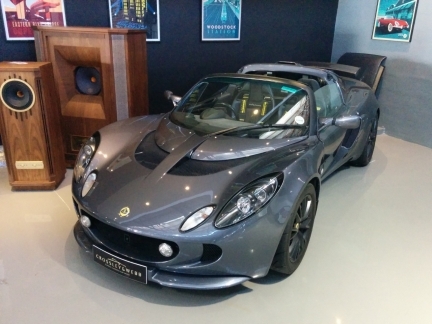 One of the many rare and exotic cars at Crossley & Web in the Cape Town central business district. 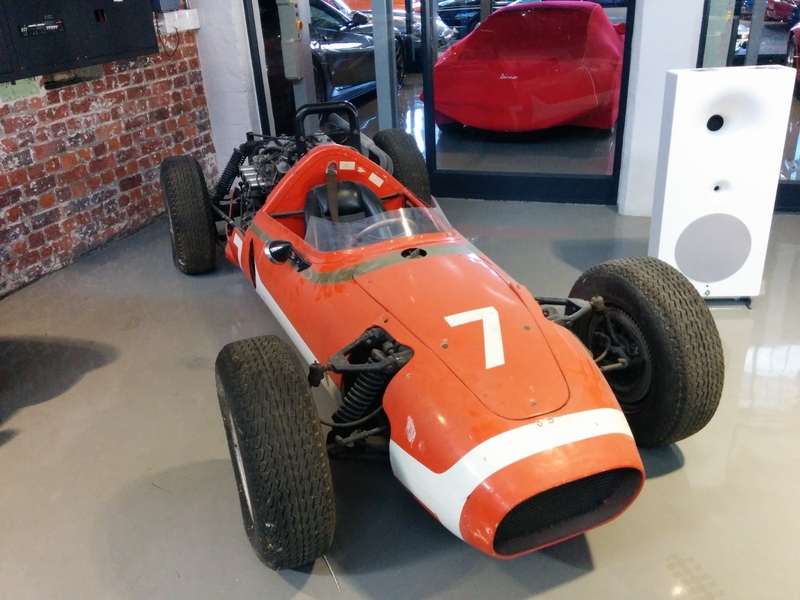 James didn’t recognize this particular car, but it is Alfa Romeo-powered. One of James’ favorites from Lotus. 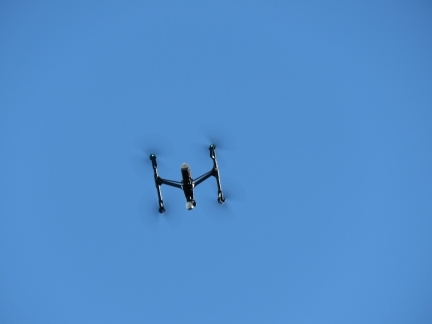 It’s a bit light on horsepower but is a great-looking machine. A batch of spaghetti sauce for the Atlantic crossing. Amazon has an office in Cape Town so James has been in the office most days over the last couple of weeks. 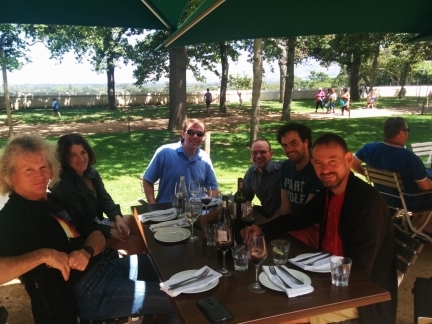 Today was a public holiday in South Africa so those visiting from the Seattle office compromised and did a morning at the office. Jennifer then joined them for a great lunch at the Groot Constantia winery for excellent food, great company, and incredible views from our table out towards the ocean. Dirona runs on a wide range of different shore power voltages ranging from 120V 60 cycle through to the common 240V 50 cycle. But that’s just the start of the diversity. In Papeete we had 240V 60 cycle. In Victoria, we had 208V at 60 cycle. Here in Cape Town we have 220V at 50 cycle. 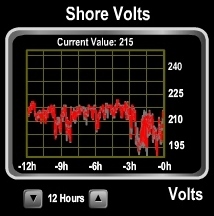 The graph shows the nominal 220V being pulled down by load to below 200V, and a few minutes ago we had an alarm as the voltage sagged down below 195V. 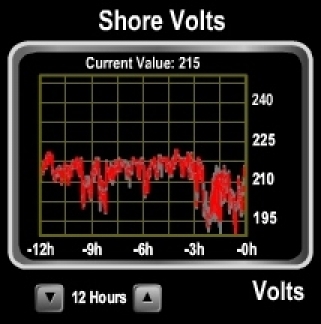 This wide voltage and frequency diversity is one of the reasons why we charge the boat via shore power but run the boat off 240V 60 cycle inverters (see A more flexible power system for Dirona). Technically, the HVAC system on Dirona is 240V 60 cycle, but will run on 50 cycle and the manufacture is fine with this. I suspect neither the equipment nor the manufacturer would be fine running the HVAC system on only 200V at 50 cycle. That’s why we run the HVAC system and the rest of the boat off the inverters and only subject the battery chargers to direct shore power.